I have created this list for those who are deeply and sincerely interested in Ayn Rand's philosophy of Objectivism and its application to cultural-political issues. I do not make full agreement with Objectivism a condition of joining my list. However, I do exclude anyone who is sanctioning or supporting the enemies of Ayn Rand and Objectivism. "Enemies" include: "libertarians," moral agnostics or "tolerationists," anarchists, and those whom Ayn Rand condemned morally or who have written books or articles attacking Ayn Rand. I do not wish to publicize the myriad of anti-Objectivist individuals and organizations by giving names, so if you have questions about any such, email me privately and I will be glad to discuss it with you. Rand never denied that unconscious (or "subconscious") processes occur in human thought. What she appears to have denied is that these processes could ever originate, in whole or in part, from below the threshold of consciousness. Hence, for Rand, "subconscious" thinking is simply conscious thinking that has been automatized, or "programmed," like with a computer. Since human beings, in the Randian view, are blank slates, nothing can ever get into the "subconsciousness" that wasn't first in the individual's conscious. Guest poster Neil Parille from Objectiblog tells the tale of Ayn Rand's odd reaction to a famous prank at the 1974 Academy Awards. While cleaning up some comments spam I came across this brief note that may have been lost in the flurry. In this post Greg criticised a passage from Lisa Van Damme's essay "The False Promise of Classical Education." What defines the hierarchical order of concepts is distance from the perceptual level, not "wideness." "Doberman" is, unquestionably, more abstract than "dog": Ayn Rand addresses this issue in ITOE, and nothing I have ever said contradicts it. Van Damme: "There is a necessary order to the formation of concepts and generalizations. A child cannot form the concept of “organism” until he has first formed the concepts of “plant” and “animal”; he cannot grasp the concept of “animal” until he has first formed concepts such as “dog” and “cat”; and so on. The pedagogical implication of the fact that there is a necessary order to the formation of abstract knowledge is that you must teach concepts and generalizations in their proper order. An abstract idea—whether a concept, generalization, principle, or theory—should never be taught to a child unless he has already grasped those ideas that necessarily precede it in the hierarchy, all the way down to the perceptual level." Greg's point in the post was that if this was true, one would start with "Doberman", go up to "dog", then to "organism" etc. Yet this seems unlikely. Van Damme and other commenters do not seem to have a direct response to this, and merely reply to the effect that Greg's demonstration is a "straw man" because Rand said otherwise in the ITOE. But if Rand's theory (or Van Damme's expression of it) does not stand up to its own derivable consequences, this is hardly Greg's problem! Rather it speaks to the basic wooliness and what I regard as the outright emptiness of most of the speculations expressed in the ITOE. At any rate, it would be interesting if Van Damme wished to reply in a bit more detail - even by proxy - to Greg's original post, and we cordially invite her to do so. The intense interest on this blog in the question of free will has persuaded me to interrupt my series on the Cognitive Revolution and Objectivism to expound on this contentious topic. 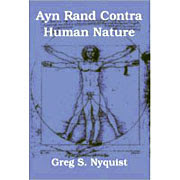 Most criticisms of Objectivism focus on the alleged contradiction between Rand's acceptance of causality on the one side and her insistence on free will on the other. "Ayn Rand's views on causation contradict her views on free will," writes one commentator. "The reason is very simple: her views on causation are those of a determinist; her views on free will, however, make her a libertarian. And those two positions are, by definition, incompatible." Oh, well, if they are incompatible "by definition," that settles the question! Such reasoning, however, is circular: the terms have been defined in such way as to reach the conclusion desired. This is rationalistic verbalism—and is nothing to the purpose. Neither is Peikoff's assertion that "one must accept [free will] in order to deny it" very helpful. Surely the question is every bit as empirical as any other concerning matters of fact. So why not attend to the relevant facts, thereby supplying one's reasonings with the useful check of experience? Causal determinism asserts "that future events are necessitated by past and present events combined with the laws of nature." The doctrine is very convincing when applied to physical objects. The material world does appear to be deterministic in just this sense, as innumerable experiments have shown. Things get a bit more dicey once we go down to a quantum level. But a propensity interpretation of quantum mechanics, as suggested by Karl Popper, may turn out to be a convincing way around these issues. In any case, the question arises: does the determinism found in the physical world (at least above the quantum level) hold good in the mental world? And if so, why? One cannot simply assume, a priori, that all of existence is fashioned after a single plan, so that if determinism is found operable in the material world, it must also be found operable in the mental world as well. Do the facts support such a supposition? Not entirely. Do physical entities or events possess the same kinds of characters or properties as percepts and images? Do they exist in the same spatial and temporal order with them? Our experience suggests otherwise. Ideas, concepts, percepts, mental images are one thing, the material world is something else. The mental and physical orders are clearly worth distinguishing. The next question is: how do these two planes of existence relate? Scientific determinism generally favors the view that the mind is solely determined by physical processes. Superficially, this view seems to be supported by the fact that the mental world depends so enormously on the brain. Yet here we must be careful. There are some facts that simply don't square with the idea that all mental processes are really only material processes in disguise. In the first place, this view strongly suggests that consciousness is epiphenomenal and, ipso facto, inefficacious. But if so, why did evolution breed and select it? Then there's the problem of our own introspective experience. We experience ourselves making decisions and choosing between alternatives. Is our own experience to be ignored as a mere illusion? But if that experience is illusory, why isn't our experience of the material world as deterministic also illusory? If consciousness is efficacious, if the mind provides a contribution to human life that goes beyond merely physical processes, then free will, in some measure or form, has been established. In what precise measure or form is a question best answered, again, by consultation of the relevant facts. Here neuroscience can provide fascinating perspectives, particularly when combined with evolutionary psychology. If the brain is a product of evolution, then free will must also be a product of evolution. But if free will has evolved, then this suggests that it has in the past, and could still, exist in degrees. A strange notion, to be sure. Is there any evidence beyond evolutionary speculation on its behalf? Yes, there is. People with damage to the ventromedial frontal cortex of the brain are no longer able to engage in effective decision making. It is as if there free will is impaired. Decision making, initiative, planning all rely on the frontal cortex of the brain. If there exist innate factors that increase or decrease how well this prefrontal cortex functions, its plausible that differences in the degree of free will could be partially innate. Indeed, we know intelligence is partially innate, and individuals with greater intelligence probably have a greater degree of free will than those wilth less intelligence. This view of the mind suggests the following conjecture: that free will is perhaps best conceived as a kind of module of the brain, working in tandem with other modules, such as those providing motivation and thought. There is certain level of innateness running through all these modules, particularly in the affect system, but there's also a certain amount of plasticity to both experience and thought, so that the mind is best envisioned as a complex web of drives and thoughts and self-initiative which interact against one another, perhaps even slightly altering one another in the process, and commencing in volitions that are influenced by thoughts, innate drives, memory, social-training and self-initiative, all working at difference degrees and intensities. Under this model, there is none of the sort of unsaddled free will imagined by Rand. The majority of humans beings are what we find them in everyday life, in history, in great literature, and in scientific research: inherently limited, imperfect, yet still capable, through initiative, discipline and hard work, of attaining a modest level of dignity and self-efficacy. Some may be able to attain more along these lines, some less, depending on the amount of intelligence, initiative, and emotional stability that they are born with. ARCHNblog Flashback: "Rand and Empirical Responsibility"
Given the recent discussion it seems apropos to re-run Greg Nyquist's Journal of Ayn Rand Studies article - which was a reply to Fred Seddon's review of "ARCHN" - on this very topic. Dave, I'd like to touch on a central point that risks being overlooked. Yes, Rand and her followers are generally - and as Mr Valliant demonstrates with his "Objecto-empiricism", even hilariously - ignorant of science. This is basically admitted every time they attempt to ring-fence some of her (and their) absurdities by appealing to a "philosophic" context, rather than a scientific one. But the key point is this: basically Rand believed philosophy should quite literally set the terms for science (she says this quite clearly in the ITOE, in a remarkable passage where she insists that philosophers like herself will tell scientists the "proper" meaning of the words they use**). Philosophy is always in control; it might refute science; but it can never be the other way around. Philosophy is the master discipline - with Objectivism at the summit of that - from which "true" science (as well as ethics, politics, aesthetics etc) flows. It could be that Mr Valliant merely thinks it is Opposites Day here at Dawkins.net. However, I think there's a bigger story here. I conjecture that it is this underlying dream, and its accompanying scholastic methodology, that accounts for this peculiar picture of a movement ostensibly dedicated to reason, freedom, science, and productivity exhibiting, as you have already noted, so many alarming tendencies in the reverse direction. **see pp289/290 "Introduction To Objectivist Epistemology"
[T]he findings of behavioral genetics are highly damaging to the Blank Slate and its companion doctrines. The slate cannot be blank if different genes can make it more or less smart, articulate, shy, happy, conscientious, neurotic, open, introverted, giggly, spatially challenged, or likely to dip buttered toast in coffee. For genes to affect the mind in all these ways, the mind must have many parts and features for the genes to affect [i.e., the mind must be modular]. Similarly, if the mutation or deletion of a gene can target a cognitive ability as specific as spatial construction or a personality-trait as specific as sensation-seeking, that trait may be a distinct component of the psyche. Moreover, many of the traits affected by genes are far from noble. Psychologists have discovered that our personalities differ in five major ways: we are to varying degrees introverted or extroverted, neurotic or stable, incurious or open to experience, agreeable or antagonistic, and conscientious or undirected.... All five of the major personality dimensions are heritable, with perhaps 40 to 50 percent of variation in a typical population tied to differences in their genes. The unfortunate wretch who is introverted, neurotic, narrow, selfish, and undependable is probably that way way in part because of his genes, and so, most likely, are the rest of us who have tendencies in any of those directions as compared with our fellows. If behavioral genetics is largely correct, than Rand's tabula rasa view of human nature is wrong. Man is not a being of a self-made soul; his volition is in fact saddled with tendencies; and his emotions are not entirely the product of his conclusions. Now the evidence for behavior genetics is very compelling. "The effects of differences in genes in minds can be measured, and the same rough estimate — substantially greater than zero, but substantially less than 100 percent — pops out of the data no matter what measuring stick is used," writes Pinker. Whether we're talking about identical twins raised apart or experiments involving isolation of genes, it all points to one conclusion: that genes influence (though they don't determine!) the mind and the behavior that emerges from it.